Thanks to the generosity of my employer, I had the opportunity to visit the libraries of the University of Virginia (UVa) and North Carolina State University (NCSU) during the week of 17 June 2013. 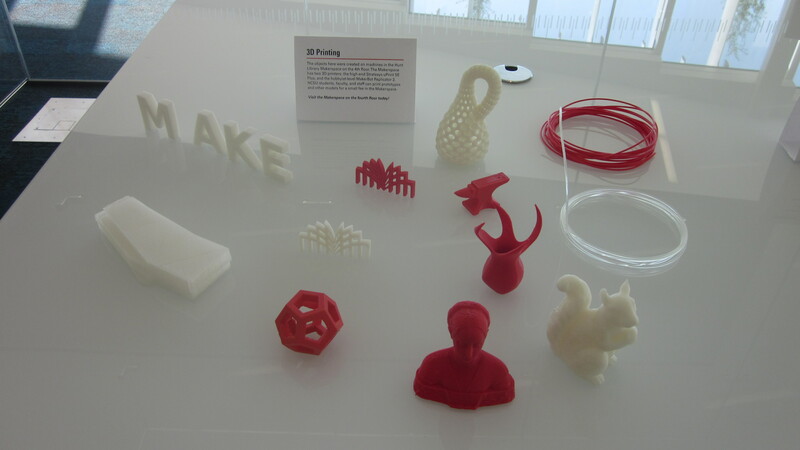 Both libraries have a strong track record of digital library innovation of different kinds. The University of Virginia is a leader in digital humanities and NCSU has gained a reputation for creating user friendly, Web interfaces to Library services and resources, in particular. a programme of workshops and training opportunities. In particular, the Scholars’ Lab runs a graduate fellowship programme where about 6 lucky students each year are trained and supported to work together on a particular project – developing valuable technical and ‘soft’ skills (including project management) in the process. a research and development team of Web developers – from a research background – who work with academic staff on development of specific projects. This all adds up to an impressive service. The Lab benefits from some endowment funding and, unusually, the research and development team is funded from the core Library budget – not from short term, grant funding. 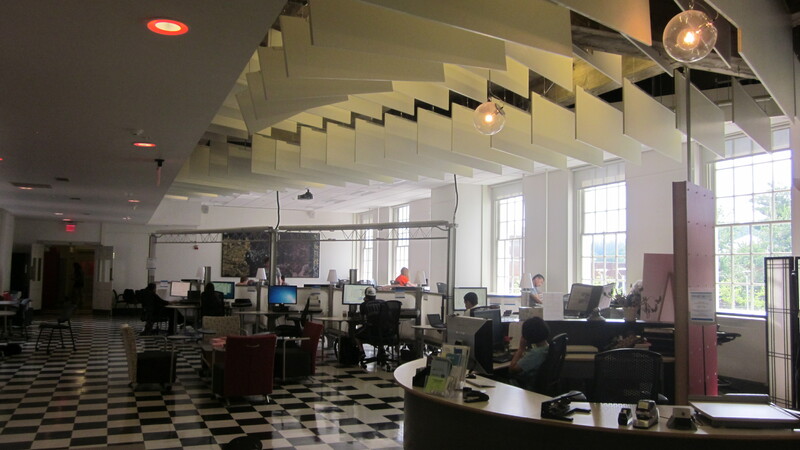 UVa is also home to SHANTI – the Sciences, Humanities and Arts Network of Technological Initiatives. SHANTI isn’t part of the Library but is based in the ‘main’ library – the Alderman Library – as is the Scholars’ Lab. SHANTI provides practical support and guidance for researchers who want and need to use information technology to carry out research – but who aren’t ‘techies’. The resources it has created include a Knowledge Base – which includes a suite of software tools – many of which anyone can use. 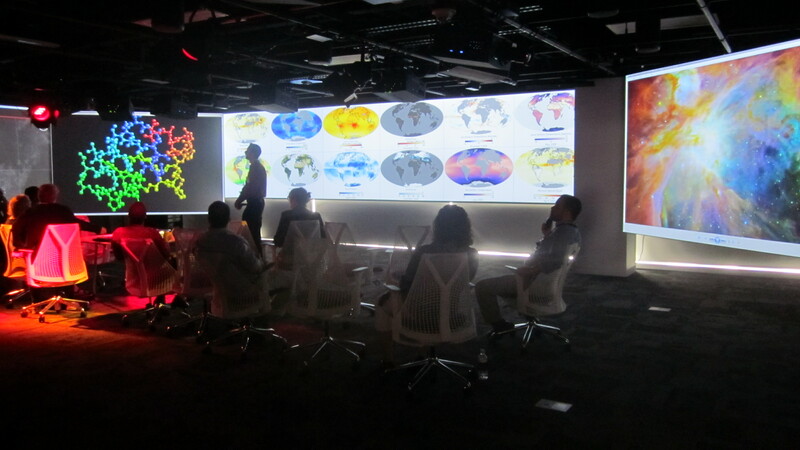 The Digital Media Lab is part of the Library and provides an impressive range of resources and support for use of multimedia by the University community – including creating videos, large scale data visualisation, a ‘telepresence’ lab and use of video clips for teaching. A lot of the technology is Mac based. The Lab is based on a newly refurbished floor of one of the site libraries which is gradually being redeveloped as the ‘learning and teaching’ library (this redevelopment also includes the provision of social learning spaces). 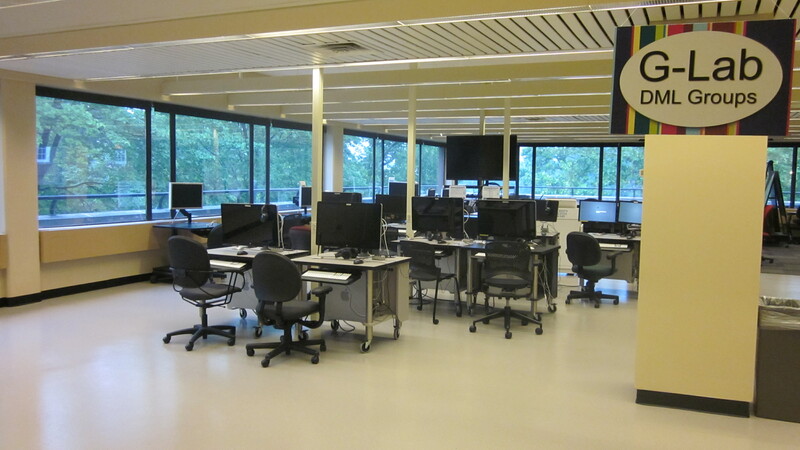 The Lab has its origins back in the University’s audiovisual service which became part of the Library many years ago. It has evolved to become more about the creative use of technology in learning and teaching – than the simple provision of hardware and software as such – although, clearly the two need to go together. While many libraries provide high end, ‘self service’ multimedia facilities – providing an expert, staffed service of this kind is unusual. Compared to many UK university libraries – and certainly compared to us – UVa Library is big – with 220 staff, 11 libraries and a complex structure. That much is predictable for a major, American university library. But some aspects of how the Library is organised are less obvious. The people I met were from a diverse range of backgrounds – the outcome of a decision over ten years ago to seek applications for vacancies from both formally qualified librarians and other relevant professions. The head of the Scholars’ Lab is an ‘academic’. The Deputy University Librarian comes from an IT background (she joined the Library to head up its technical services, originally). The head of the learning and teaching focussed library is a learning technologist. A recent appointee to the University’s very impressive Special Collections Library has a background – amongst other things – in the rare books business. Some recent senior retirements and resignations have led to a decision to ‘flatten’ the structure – removing some second tier posts and bringing the managers of some of these specialist, newer services into the management team. 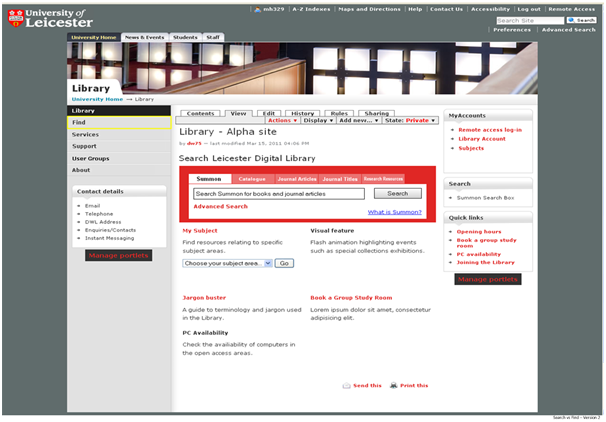 NCSU Libraries won an award from the ALA for its Web site in 2011. In 2010, it won an award for its Library Course Tools project. Back in 2000, it won the ACRL Excellence In Academic Libraries Award. So, what has enabled NCSU to sustain this consistent record of service development and success? 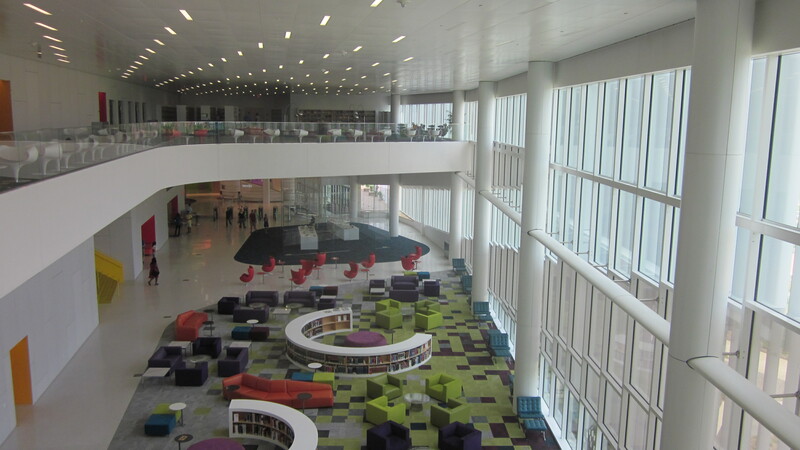 Like UVa, NCSU Library is a big department – with about 220 staff and a budget of about $20m. The University has 35,000 students. Again, like UVa, the Library has quite a complex staffing structure. One thing which is notable about this structure, is that there is both a Library IT and a Digital Library Initiatives (DLI) team. Unusually, also, the Library IT team runs both servers and storage for the Library – not just Library specific applications (this wasn’t the case at UVa Library where – like us – they see servers and storage as clearly being part of central IT infrastructure). I met some members of the DLI team. As the team name suggests, their focus is on developing and implementing new services – such as the Library Course Tools service noted above. The team has existed for about 12 years – and grew out of a small service which the Library had created to support use of GIS and geospatial data. Most members of the team are librarians – who have become skilled Web Developers during the course of their careers. As librarians, they understand the context within which they are working and the services that are being provided – and this understanding combined with the technical skills clearly makes for a powerful combination. This is also true of some of the members of the Library IT team – with the person responsible for the specification and installation of the very extensive IT facilities in the new Hunt Library (below) being a qualified librarian with an Arts background (who then developed a specialism in IT). NCSU has a ‘Library fellowship’ programme. This means a number of two year, fixed term posts which are open to newly qualified library professionals. Postholders are based in a ‘home’ department and also work on a project. Some of these projects are very significant. For example, one Library Fellow is developing a Web based application for browsing the contents of items in the Hunt Library’s new ‘bookBot’ (see below). About 50 people have been through this programme since it started. Interestingly, many members of the DLI team originally joined the Library through this route – so, it clearly seems to have worked as a way of attracting capable, highly motivated people who – crucially – are looking for on-going opportunities to learn and develop on the job. I was interested to find out how the DLI team communicates with other teams. The picture that was painted was of lots of horizontal communication i.e. between teams. Ideas for service development are as likely to emerge this way as be from ‘top down’. They said this works because individuals take responsibility to make communication with their colleagues work – they don’t wait for a ‘manager’ to do it for them. Later on I spoke to a member of staff in a public services, student facing role – who sung the praises of the DLI team – so, she clearly saw them as student focussed and helping her to do her job. There is still, structured, organised decision making because there needs to be. But they have a pragmatic straightforward process for specifying and agreeing projects that are going to be resourced – taking a 2 sides of A4 approach to make sure objectives, timescales, responsibilities etc. are clear (something we have tried to do consistently in recent years). The Hunt Library is a major development for the Library, the University and the evolving concept of what a ‘university library’ is and what it is for. The Hunt Library opened in January 2013. It cost $110m and, so, represents a huge investment by the University (and its primary funder the state of North Carolina). It joins the University’s other primary library – the Hill Library – which dates from the 1970s and is a ‘traditional’ ‘book tower’ library – lots of shelves, lots of floors, lots of single study spaces (although in 2011 the entrance floor of the Hill Library was totally redesigned in ‘learning commons’ mode). The Hunt Library is on the university’s technology park – which is also the home of its large Engineering and Textiles teaching programmes and research (NCSU is – largely – a science and technology institution). 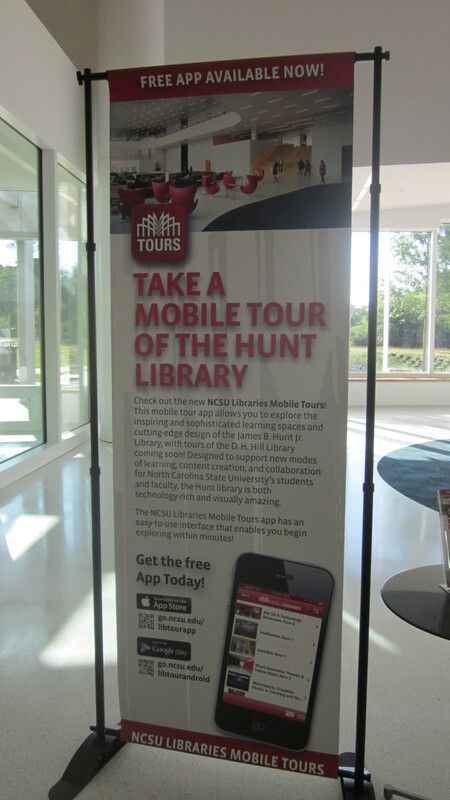 There are a lot of things about the Hunt Library that you would expect in a modern library. lending of a huge range of equipment – and accessories – including laptops (of different kinds), high end filming and photography equipment, storage devices etc. The technical facilities aren’t just used by the engineering students etc. but also by their Arts and Social Sciences departments (they do exist). 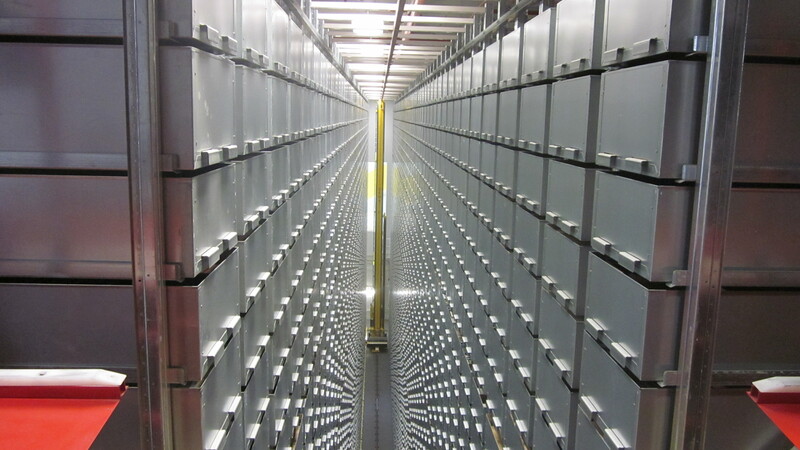 The Hunt Library is also about books – but most of these – 1.5m – are stored away in an automated, high capacity, racked storage system (the bookBot!). Users request items through the Catalogue and they are delivered to the Hunt Library service point within about 5 minutes (some staff intervention is required). This system cost about $4m to install. What about staffing such a facility? No new money was available to staff this library – so existing staff have been allocated between the Hunt Library and the Hill Library. Students are employed to help at the Hunt service point and with the bookBot. There are 4 people on duty ‘front of house’ at most – this is between 10.00am and 4pm. So, lean front of house – which reminds me of the Information Commons at Sheffield. 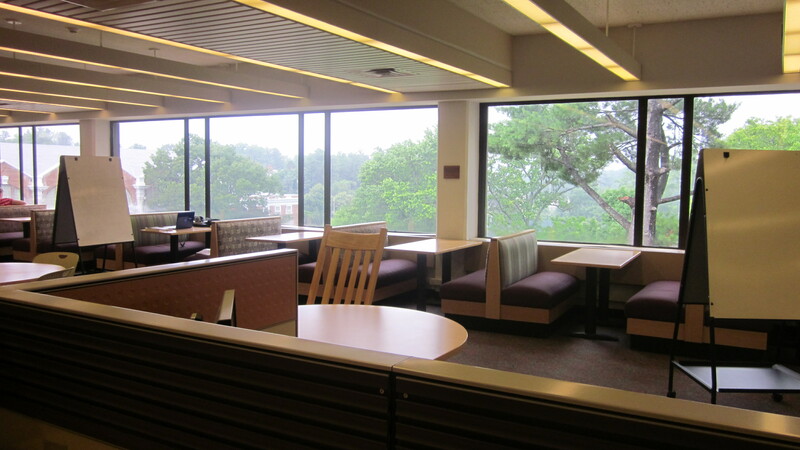 The Library is open 24 hours – with staffed services continuing overnight (two Library staff employed for the purpose and a student helper – a model they already had at the Hill Library). While use of some of the high end facilities is by appointment with specialist staff, most of the facilities can be used directly by students and they have found that students have needed very little ‘training’ to use them. So, you visited UVa and NCSU – so what? This clearly was a great opportunity for me personally as I have long wanted to see something of the large, North American university libraries in action (because, one way or another, what happens in the North American academic world has a huge influence on us and we are almost entirely dependent on library systems and resources provided largely for the North American market). But there are also some specific questions which I think we could realistically ask ourselves based on the experience of these libraries – despite the fact that they are clearly much larger and much better resourced than we are (although they don’t necessarily support a very much more students than us). What opportunities do we have/can we create to attract technically able, highly motivated, early career professionals and then develop them on the job? How do we improve access to generic software tools/solutions for digital scholarship/humanities projects at Leicester – including exploiting the tools identified/created by SHANTI, George Mason University and others? (there is a Web developer need here as well – currently the subject of a bid to the University’s Research Infrastructure Fund which Simon Dixon and Dan Porter-Brown have put together). I’d be interested to hear your views. In August last year the Library launched a new website, and in order to facilitate its creation, myself, Selina Lock and Mark Harrison ran a couple of user testing sessions, on the original website and alpha version of the new website. The redesign was prompted by the University moving to a new content management system, and there was support from an Information Architect in holding sessions to discuss content and organisation of material. The focus of the user testing sessions was therefore on navigation around the website and terminology. 15 participants took part in the testing on the original website, and 5 participants in the testing on the alpha website (where we experienced significantly lower take-up and turnout to the tests). A mix of taught and research students and staff were recruited to participate in the testing, and there was a good spread of subject disciplines represented as well. In order to get a little bit of background information, each participant completed a questionnaire. This indicated that around half of the participants had not been introduced to the library website by their Information (subject) Librarian. From this we could conclude that a signficant proportion of users would be approaching the website without having received formal training on its use. 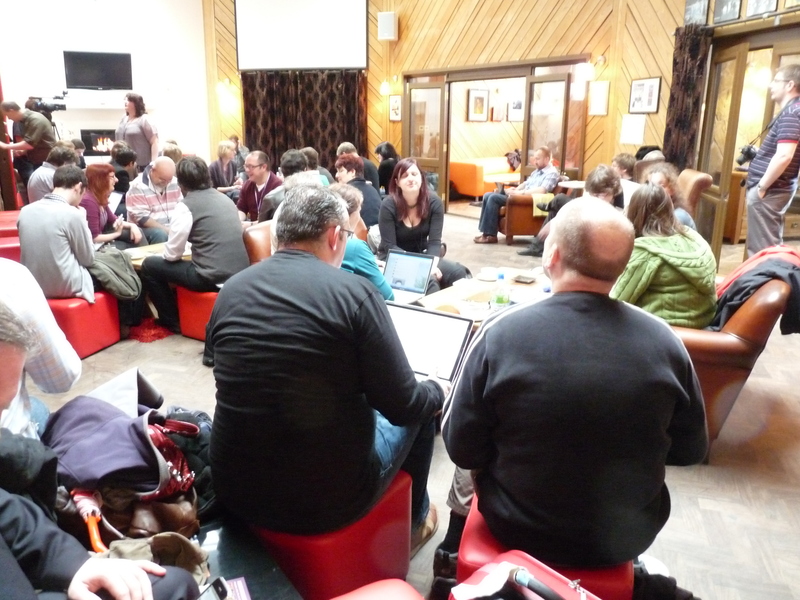 Wherever possible the participants were paired, and encouraged to discuss the tasks they were given aloud. These discussions were recorded. In both the original and alpha website tests tasks involved navigating around the website to find certain pieces of information, such as a book, information on a company, a PIN reminder and a journal article. These tasks were identified as common user activities by the librarians. It was therefore concluded that terminology needed to be improved on the new library website, and that there also needed to be more consideration of where information was located on each page. The improved structuring of the website did seem to have improve the location of information for some tasks in the alpha website testing. In the alpha testing, users were also presented two alternative mock-ups of the alpha website, with different terms on each. Half of the groups saw version A first, and then commented on the version B as an alternative, and the other half saw version B first, and then commented on version A. Some terms were more debated than others. A particular issue involved differentiating between the new discovery system, which allowed searching by journal article title, and the existing journal title search, with participants putting the article title and journal title in both boxes interchangeably. The expertise of the users had a significant impact on preferences for some terms. Novice users preferred the label ‘Books’ for the catalogue search, but the more experienced users (particularly academic staff) felt that this oversimplified the diverse range of materials in the catalogue. Where an explicit preference arose, this term was included in the new version of the website (now visible at www.le.ac.uk/library). However, even the current solutions to the most debated terms (the Articles, Journals A-Z and Books searches) continue to confuse a proportion of users. Don’t assume that library website users will have had training: a proportion of users will always be approaching the site ‘blind’. Terminology is an issue, and some terms present bigger challenges than others. Describing searches is a particular problem because of the multiple search interfaces available. This problem isn’t yet entirely solved by discovery systems (which don’t always offer journal title searches, for example). Information needs to be consistently presented on different parts of the website and help needs to be contextually located, near to its point of use. The difference between library systems (catalogue, journal title search, discovery systems, databases) are not instinctively understood by users. Furthermore, once a user enters one particular system, it will often serve as a dead end: users rarely return to the homepage and look for an alternative route to information. Many of these conclusions are directly applicable to the design of library websites in general, and the outcomes were consistent with more general guidelines for website usability. I was able to get to the third day of LILAC Conference 2011 (Librarians’ Information Literacy Annual Conference) this year held in London on the final day at the LSE. I’ve put down the main points I picked up from some of the sessions I attended. Does information literacy have a future? Geof Walton & Alison Pope. Perhaps it’s a sign of the times that people are concerned about their future in an economic climate of cuts that this session was so well attended. Geof Walton modelled a session on enquiry based learning by giving us all a set of questions to discuss in small groups and report back. – How do we manage the expectations and perceptions about the library and information of various groups; from students to academics / researchers to admin staff. – How to make more connections to get more timely training/ teaching into student’s courses. – Information Literacy as a birthright, related to literacy in general being able to read. Its not a luxury but a life skill. – Need to be able to demonstrate the positive outcomes. – Teach alongside academics so they can contextualise information literacy skills. Geof Walton emphasised the need for research informed teaching, and enquiry based learning. Information literacy is the scaffolding to enquiry and it can blend with technology supported learning. – Web 2.0 is old now, but actually no one knew what it was. Its settled down but not gone away and we are all influenced by it. Students don’t know what web 2.0 is although they experience and use it themselves all the time. – We are heading for an increasingly mobile and social world and that won’t change. Our job is to accommodate to that. – There are early adopters and slow adopters. People don’t change quickly. We can watch the early adopters and watch from their mistakes. – The nerds are a minority. Most young people use tools but don’t have a techie understanding of them. – Younger generation are not good at sharing and neither are academics / researchers or librarians. We need to reallocate the time we have and change the way we behave and work. – Only when you try to write something for wikipedia do you realise how difficult it is. He had some engaging thoughts on information literacy, for instance it has been ‘pampered’ by its attachment to academia, he suggested we should be thinking of it in the context of transliteracy. This made me think that information literacy as we know it is based almost entirely on textual information rather than visual or audio. We are dealing with increasingly multimedia information for instance from the familiar such as video to emerging technologies for instance Mike Matas; A news generation digital book and augmented reality / virtual reality. New media is in perpetual development but on a day to day basis our students need help dealing with old media and communication tools. Perhaps the gap between the two is where we come in at present. This links in with Jesus Lau’s keynote speech on the UNESCO project to develop international indicators of information literacy. He has been developing this alongside folk from the media world to develop Media Information Literacies. The focus is on everyday experience for instance access to news media rather than academic information. The competencies are based on how these intertwine. Led by faculty member who is not a librarian Lana Ivanitskaya is an academic in industrial / work psychology. She designs tests such as personality tests and has to assess them. Her first point was that competencies are not just knowledge and skills but also attitudes and beliefs. If you only focus on the skills you will miss a lot. Students own knowledge of their skills gaps is a familiar scenario for librarians. First year students think there is nothing you can teach them (often), PhD students seem to have the opposite attitude. Lana Ivanitskaya described the RRSA (research readiness self-assessment) online survey which includes tasks such as evaluating websites and application of knowledge. The survey includes ‘soft’ questions which assess the students’ beliefs as well as their results and they have found this is very predictive of their level of attainment. The RRSA survey also found some interesting differences between students and experts at information skills. They found experts better and that students overestimated their skills. In fact the experts under estimated their skill the more expert they were. Lana stated that students still find how to do research hard and are not taught how to do it. She compared the number and quality of references cited in student papers between those who had completed the RRSA and those that had gone through library information literacy training. She found that the impact of library teaching was three times better than the RRSA, but that the students preferred doing the RRSA and were more willing to do it. So the message? Lana wondered if we should focus more on online training. 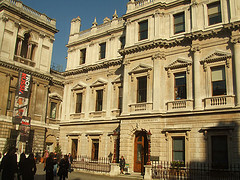 Without seeing in detail what either the RRSA consisted of compared to the library training its hard to say of course. Perhaps its down to the old messages of getting to the students at the right time and place and using the right voice. Knotworking as a means to strengthen information skills of research groups. Elija Nevalainen & Kati Suvalahit. Finding new ways to connect with colleagues across campus that work isn’t always easy. At the University of Helsinki they had success using ‘Knotworking’ a way of working developed by one of their academics, Professor Yrjö Engeström. The process brings together different groups from across the organisation to work more quickly and less hierarchically than team structures. ‘Knots’ are formed to find solutions to specific problems, and the problem they wanted to address was how to re engage with researchers. – Research groups think information literacy is for the good but they have no time to do it, its best aimed at Masters students. – Information skills still important to research groups are; bibliographic tools, searching databases, current awareness, obtaining material you can’t get locally, establishing networks of contacts, organising references, consulting library staff. Interestingly the librarians learnt that their changing role put them in the same boat as the researchers, and they learnt a lot about the researchers from this project. The project also had the unexpected effect of gelling together the researchers as a group. The project reinforced the value of personal networks and working with user groups. Working with researchers as equals also had a beneficial effect on the library staff who developed greater confidence in working in emerging subjects and services they don’t yet have expertise in. These themes are not new of course, but success in developing a change in culture is something often dreamed of but not realised. UKeIG ran a very informative workhop on mobile access to information resources given by Martin White on the 13th April 2011. This was good timing for me as we are currently working on a new Library Web site. ‘Mobile’ has obviously been on our minds although it has also been clear from early on that we would not be able to address the delivery of mobile services within the immediate project which needs to be completed by the end of August this year. We also need to think about the whole of our Library ‘Web presence’ – the formal Web site but also the Web interface to the Catalogue and the associated Library user account, our Open URL Resolver, Summon (which we are implementing at the moment) and our digital institutional repository. Then there is what publishers and other information providers are doing and this varies widely. While I already realised that the options in developing mobile services are not clear cut, this workshop underlined the point! Do you make your Web site ‘mobile friendly’ so that it is usable on smartphones and other mobile devices or do you create a bespoke Web site for mobile devices? Do you provide mobile or Web apps? Mobile apps deliver specific functionality and are designed to run on the operating system of a specific device i.e. using Android, Symbian or other. Web apps also offer specific functionality but are designed to run in a Web browser – so have the advantage of running on any device but it must be connected to the Internet for the app to work. What sort of mobile device are you trying to cater for anyway? Smartphones? Tablets? Or both? Tablets and smartphones are very different propositions given the much larger screens which tablets have. What do your customers want to be able to do from a mobile device? Not surprisingly, this is the most important question of all and it is certainly a question that we currently do not know the answer to. Having started testing access to our Web interfaces from an iPad and smartphones recently the ‘user experience’ certainly differs radically from different devices. Our existing and new Web site are perfectly usable on an iPad as is our Catalogue and Summon. But the ‘experience’ using an iPhone and the HTC Wildfire we have tested to date are very different. This is not surprising given the tiny screens and rather fiddly touchscreen keypads involved. While our new Web site works *technically* on these phones, the interface is so compressed that it is virtually unusable. Yes, you can move about the screen and expand different parts of the page but it is a laborious process. Entering usernames and passwords to login into library accounts and resources is even more tedious than it is on a desktop. We need to start with some user research to find out what our students and staff would want and find *easy and convenient* to use from small, mobile devices. One of my fellow workshop participants was from another university library and they are a bit further ahead than us in their thinking on this. They plan to start with quick, ‘look up’ type information such as opening times and PC availability and they have some user feedback which supports this. Note that these are all sites with the commercial imperative and income to get it right. The American Chemical Society and Nature were mentioned amongst publishers who see major uses for ‘mobile’ – in providing alerting services to newly published research, for example. Note these publishers use of ‘apps’. An NHS librarian amongst us noted the demand they were getting from some clinical staff who originated from the States to be ‘apped up’ to access content available using local subscriptions – suggesting what might be an emerging need i.e. support with installing the appropriate apps. Although how far can you take this? And on the libraries front? They have gone for the specific mobile site – which works well if you know it exists but, if you don’t, and you go to the ‘regular’ site you get a very different experience. And, noted by my colleague Sarah Whittaker – North Caroline State University Library. Finally, we were pointed to an article in issue 64 (July 2010) of Ariadne which outlines how mobile delivery of information and services is being treated as an integral part of developing Birmingham’s new ‘central’ Library – the Library of Birmingham. I attended a JISC workshop on use of user activity data on 14th July. The purpose of the workshop was to present some recent JISC funded and other work in this area and to consult on what additional work JISC might usefully fund in the future. The presentations and discussion largely focussed on user activity data gathered by library management systems such as search histories and circulation data. Other types of activity data would include usage statistics for electronic journals at both title and article level and activity data generated within VLEs. So, what might you want to use such activity data for? Well, as the title of the workshop suggests, one use is to gain ‘business intelligence’ of different kinds. So, in a library context, to see what resources are being used and by whom. This is, of course, very topical in a challenging economic environment where difficult decisions need to be made about what to spend money on and what not. Another possible use, is to use activity data to enhance the ‘user experience’ in different ways. The best known example of this is probably Amazon. So, ‘customers who bought this item, also bought these items’. In a library context, this could become, ‘people who borrowed this item, also borrowed these items’. The best known (only?) university library in the UK which has been using activity data in this sort of way is that at Huddersfield – and the workshop included a presentation from Huddersfield’s Library Systems Manager, Dave Pattern. This illustrated that borrowing of unique titles has increased at Huddersfield since the ‘recommender’ features were introduced – suggesting that students are benefitting from a new means of locating related resources. The JISC funded MOSAIC project has been exploring how user activity data can be extracted from library management systems and combined with data from student record systems to provide recommendations along the lines of ‘Economics students who borrowed this item, also borrowed these items’. And Ex Libris now have a recommender system called Bx which uses activity data taken from open URL resolver log files. Why haven’t more libraries done what Huddersfield has done? Possible reasons touched upon included lack of data (some systems do not log the necessary activity data), limited access to technical skills, competing priorities, concerns about data protection and other legal issues. Why would a senior manager commit time and resources to exploiting user activity data? Business drivers might include usage analysis to demonstrate/assess value for money; improving students’ ability to find relevant resources, therefore enhancing the student experience and improving performance and retention rates. Who ‘owns’ user activity data and who should manage it? Issues here include user consent, trust and the purposes to which data is put. One thing which the workshop underlined for me is that there are many kinds of user activity data which can be used for many different purposes. This diversity of data and potential purposes can complicate the discussion at times. Discussion suggested that what may be needed now is some practical use cases, addressing practical needs which provide more evidence of practical benefits in an HE context. And that’s on the recommender system side of things. On the business intelligence side of things, the case for committing staff time and resources to analysis of user activity data seems easier to me to make at the institutional level in current circumstances. Last but not least, JISC is currently funding development of a Usage Statistics Portal – which will provide libraries with a mean of accessing e-journal usage data in one place. That certainly is addressing the ‘business intelligence’ aspect of user data.